An air mover is typically defined as a portable ventilation control device. This particular unit is great for the carpet cleaning and flood restoration industry. It can dry large areas of carpeting in short periods of time, all while pulling low amounts of power. If there is not sufficient air flow over the damp carpets, the air will retain moisture, and not allow the carpets to dry. A typical carpet should not be wet for more than 24 hours. If this occurs, and it is not immediately dried and treated, mold and bacteria can start to grow in your carpeting. In humid climates, at least one of our air moving carpet dryers is necessary for every carpet cleaning job. Quiet 3-speed design, from 1060 CFM to 1500 CFM. 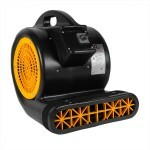 Weighing in at just 30 pounds makes this carpet drying air mover extremely portable. Molded handle is offset for balanced carrying, as well as allowing each unit to be stacked one on top of another. Polyethylene housing protects internal components from damage, while the steel cage protects motor from debris. Molded cord hook provides convenient cord storage. This is a review for the Carpet Drying Air Mover.